Anaerobic digestion can play a major part in the fight against climate change, and the importance of the link between anaerobic digestion and climate change reduction is still not fully appreciated. So, read on and see whether you then agree that making biogas to reduce greenhouse gases, has enormous potential for climate change reduction. Anaerobic digestion is the process that makes biogas and other useful products using micro-organisms in the absence of air. In other words, making biogas helps reduce the greenhouse gas emissions which cause global warming, and severe weather events. Anaerobic digestion has the ability to reduce global greenhouse gas emissions by 18-20% across the waste, agricultural, energy, and transport sectors. The industry is uniquely positioned to help achieve emissions reduction and mitigate many of the impacts of climate change, through capturing organic wastes, producing renewable energy, and returning nutrients and organic content to the soil. It does this through capturing organic wastes, producing renewable energy, and returning nutrients and organic content to the soil. Anaerobic digestion can help to achieve the global Paris Agreement goals and many of the UN’s Sustainable Development Goals. Notably, it does this around food supply; clean energy for power; heat and transport and waste management. It can improve soil, air, and water quality. In the UK, the government like many others, is under pressure to act on its climate change policies, from the Independent Committee on Climate Change. The Independent Committee on Climate Change is highlighting the gap between the policies required to meet targets set under the Climate Change Act, and the policies currently in place. With the right support, AD can help all governments to meet their climate goals, by reducing UK greenhouse gas emissions. 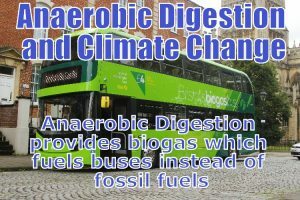 In the UK, the Anaerobic Digestion and Bioresources Association, has quantified the potential of anaerobic digestion and climate change reduction. It has recently been reported that anaerobic digestion can reduce UK greenhouse gas emissions by 5%. Text is based upon the ADBA Biogas Show page here. The Commission on Climate Change have issued a report to the UK Government, detailing the achievements of sustainable policy while highlighting areas of industry that are falling behind. According to the report, a 40% drop in emissions has been recorded since 1990 – complemented by a boom in economic growth. 75% of emissions reductions has been attributed to the efforts of the power sector, with the report recognising the failure of other industries such as transport and housing. Biomethane will in coming years be generated at hundreds of sites around the country (Ireland) through the use of anaerobic digesters (ADs) and injected into the national gas grid. Ireland is uniquely well-positioned to exploit this green gas. Farmers and the food industry in particular are set to play a key role in turning energy from waste, such as pig slurry, into heating. Anaerobic digestion uses microbes to break down biodegradable material in the absence of oxygen. It generates biogas, which is combusted to generate electricity and heat, or can be processed into renewable natural gas (biomethane) and transportation fuels. Currently, there are fewer than a dozen anaerobic digesters in Ireland, but Ian Kilgannon, innovation and business development manager with Gas Networks Ireland (GNI), says it is a proven technology and a low-risk investment. Ireland is about to benefit from coming late to the game. … In State policy terms, biomethane is about to be recognised for its role in decarbonising gas and addressing climate change challenges, and is expected to benefit from a State subsidy backed by major capital investment under the National Development Plan. As fossil fuel prices rocket, the opportunity for producing energy on farms by anaerobic digestion (AD) is something most growers should be investigating, says Jeremy Tomkinson of the National Non-Food Crops Centre. He was launching a new computer calculator at Cereals 2008 to help farmers decide whether the idea is feasible, given their own circumstances, and if so to seek the not inconsiderable funding required. There were many policy drivers and incentives to encourage such developments, but much confusion, he said. NFU non-food crop specialist Jonathan Scurlock said that, until about 18 months ago, he had been “quite sceptical” about the potential for AD on farms. But in the quickly changing energy and environmental climate, his opinion had changed. Under new (UK) NVZ rules, many livestock farmers were likely to have to spend large sums simply to store slurry for extended periods.